im guessing that beast SS issue is a glitch, especially if its only on one evo. good chance that will get fixed in a day or so. In my case both evos have the glitch. No problems with either of mine, could be an issue with one of the other birds negating the effect. Just ran into Gates of Hell at level 23. Enemies are weak for my 136907 team power so I managed to take my time and wait for Eddie to kill them every 5th moves. I think red birds need to come in. Maybe even Bette for a fast SS. I'm taking it easy this event - personal and clan rewards only. For the first time in a long time, I've got silver tickets in my in box and my gem count is +1500. Just need some white and yellow events now - inbox evo keeps expiring since I don't have birds to spend it on. Looks like another 2 week event. Also, this new bird looks terrifying. Take it thats the one they were talking about in the patch notes. Last years thanksgiving event was only a week, is the 11days 16hrs not the start time? So event after next? It could be start time, but I think the Beast event splash was also ~11 days and it turned into a two week event. It may only be one week though; as will all things Rovio, Subject to Change. OMG those birds are so scary!!!! Jesus Christ, there's barely any of that in the game! Nyk, Tigerangels42038 and A. Wolf like this. 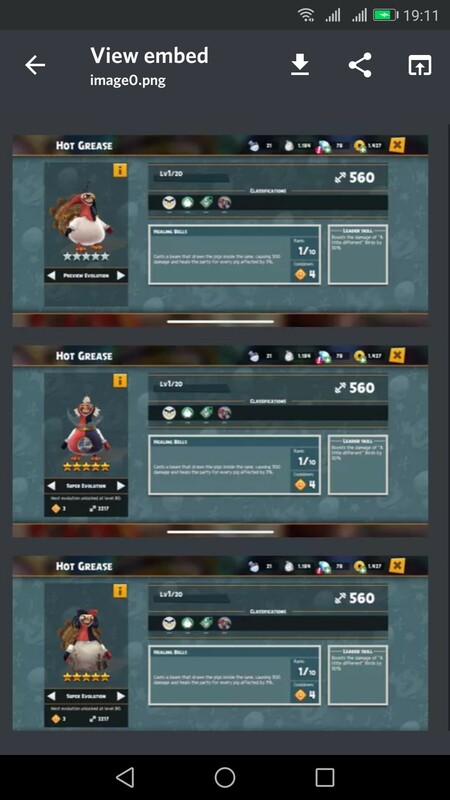 Are there any 5* birds with that class? I just told my clan to have a look at what they have for next week. Considering how few birds in the Working Class Hero category advised they take stock and have a look if they need Terence just for the % boost, newer players that usually rely on the 75% category are going to struggle with that one. Buds, Tigerangels42038, Nyk and 1 other person like this. Leader ability boosts birds with the 'A little bit different' tag.